Its History and Architectural Heritage: A bustling trade centre in the Middle Ages, Orléans is famous as the city where, in 1429, Joan of Arc, routed the English out of France. The old medieval city, which has been entirely renovated, is a stroller’s paradise with its animated pedestrian streets and colourful wooden-beamed houses. The Cathédrale Sainte-Croix’s 114-metre steeple dominates the city. This awe-inspiring landmark is surrounded by a number of masterworks of Renaissance architecture, such as the superb 16th century Hôtel Groslot, which served as a guesthouse for many a king. The city also has innumerable shaded parks, private mansions and museums, including its Musée des Beaux-Arts, considered one of the major museums in France. Contemporary art fans will love the Frac Centre with its stunningly innovative architecture and exciting cross-disciplinary art shows. 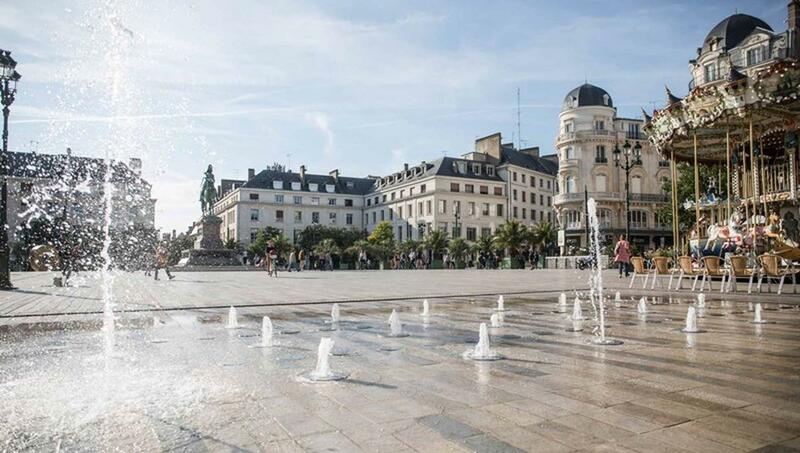 Its Swinging Waterfront and Many Riverside Activities: Orléans, once France’s main river port and the hub of a busy and prosperous merchant marine trade, has totally revamped its waterfront. The new port area and its docks now hum with activity, serving as a magnet for pedestrians and night-owls, who flock to the riverbanks for its many events and delightful open-air cafés. The redeveloped banks of the Loire are also a great place to enjoy the pleasures of nature. Hop on board for one of the river tours offered by ‘Merci la Loire’. On Sat. mornings you can even go to market by boat. An original and fun way to do your shopping! Or take an evening tour and enjoy the peaceful silence of the river with a glass of Loire Valley ‘bubbly’ in hand. Cycling enthusiasts take note: the region’s ‘Loire à Vélo’ route has 155 km of cycling trails along the Loire River, and a lovely section of traffic-free riverside riding that will take you right into the heart of town. Its Great Shops and Art Galleries: Orléans has a large newly paved pedestrian district, with everything from small designer shops to big department stores. It’s easy to get around so you can do a lot of window-shopping along the way! And if you’re an aspiring art collector, stop at some of the city’s the many fine art galleries for a brilliant array of artwork. And Flowers! Orléans is the birthplace of French art of gardening. Check out the The Parc Floral de la Source, a 35-hectare landscaped park on the outskirts of the city, for a fine example of its talents. Listed as a ‘Jardin Remarquable’, the Parc Floral is in fact a large, open space with a series of unique gardens. Its roses, irises, dahlias, fuchsias – even vegetables – fuse together to create a magical patchwork of colours. A hub for the locals and an absolute must-see for out-of-towners! Check out the video for some fabulous images; plus it will give you the chance to practice your French! What to bring home from your city break? Cotignac, an age-old quince-based sweet specific to Orléans, or some of its world-famous mustard and vinegar, a real local institution!